Digital Technology realises that TVs have truly come of age in the last couple of years, with relatively cost-effective LCD and Plasma TVs. We have a range of new, graded and reconditioned digital TVs available at our showroom at reduced prices to suit most budgets and all come with a 12 month guarantee. Visit our showroom where we can take the time to discuss your needs and the budget you have for the TV you are looking for. 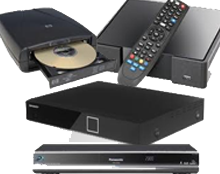 Whether its digital receiver/recorder, satellite receivers, DVD player etc that your after Digital Technology can help you with your purchase. From the appliance choice to the best advise on the installation we can assist you, Digital Technology also offer an insallation service if required. Copyright © 2019. Digital Technology, All Rights Reserved.